The Ghana Chamber of Mines has called on the government to accelerate efforts to encourage local businesses to invest in Ghana’s mining sector. Director of External Relations and Communication, Mr. Ahmed Nantogmah, speaking on behalf of the Chief Executive Officer of the Chamber made this call at a media interaction in the Eastern Region on Wednesday, 16th September, 2015. The regional interaction is a periodic activity of the Chamber to brief the media on happenings in the mining industry. It is also a platform to discuss issues that require urgent attention from local assemblies, community leaders and regulatory bodies in the sector. 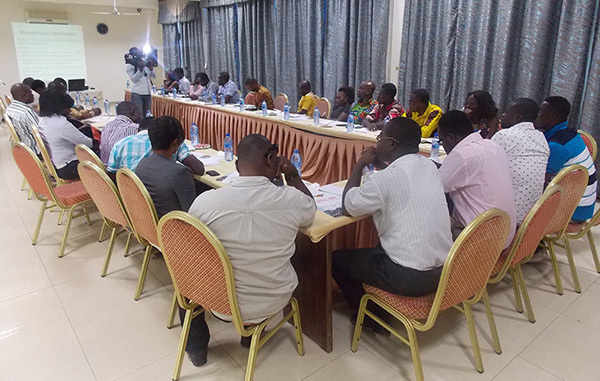 The event brought together 29 journalists from the Eastern Region and correspondents of media houses in Accra. Delivering his presentation prior to the discussions, Mr. Nantogmah said the Chamber is working with the Minerals Commission and the Ministry of Lands and Natural Resources to encourage more local businesses to invest in essential inputs for the mining industry that can manufactured locally. He was of the view that if this is effectively implemented, it will improve the fiscal consolidation of the economy and the populace will be the ultimate beneficiary. He said mining companies have invested heavily into communities and social projects as a way of improving the livelihoods of the inhabitants living in close proximity to the mines. He however stressed that: “Beyond all the social investments by the companies, it is the government’s responsibility to invest in infrastructure such as roads, schools and hospitals to improve the lives of the people. Mining companies through their social investments only seek to complement what the state is providing”. Mr. Nantogmah expressed his profound gratitude to the media in the Eastern Region for being close partners of the Chamber and encouraged them to continue to educate the public about the contributions of the mining sector to the economy as well as the challenges facing the sector. He urged the journalists to be watchdogs of the environment to support the country’s quest to rid communities off illegal mining activities. The Regional Secretary of the Ghana Journalists Association, Mr. Maxwell Kudekor, thanked the Chamber for creating the platform for such healthy deliberations. He indicated that journalists in the region will continue to support sectors that contribute immensely to the development of the nation and law enforcement agencies to weed out criminals destroying the environment in the name of mining. The Community and External Relations Manager of Newmont Ghana (Akyem Mine), Mr. Oduro-Kwarteng Marfo, represented the company at the event.